Can we coin the term "Heisenblogging"? I too did the search when I saw this yesterday. I'm not sure about the filtering search (maybe it only checks page text, and not links? ), but I, too, searched for "died in a blogging accident" shortly after he posted the comic, at which point there were 18 results. I looked at a couple, and they just pointed back to the comic. A commenter on one of the pages in that search said that there were only 10 at the time of his search, so I could see things getting back to two. I suppose I should have searched that set of results for the "original" two sites, but it would seem they are lost now. Well, whatever it is it is certainly hilarious. How the hell do you die in a blogging accident? "How the hell do you die in a blogging accident?" 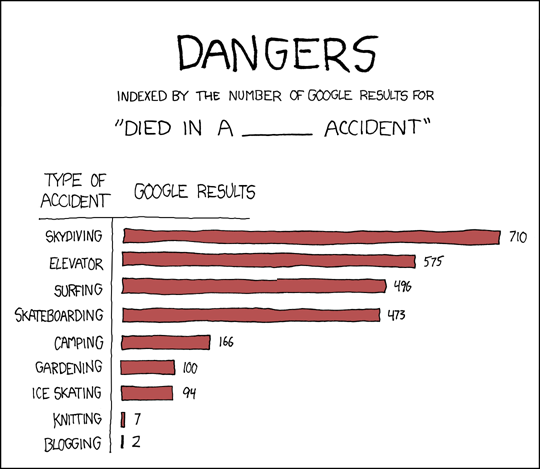 It's the knitting accidents I'm curious about. I'd buy the 2 result per-comic, even with the filter, all I can find are references to the comic. If someone can find a reference that doesn't go to the comic I would love to see it. I get over 16,000 hits now, but when I first searched I only found 10 and most of them where references to the xkcd comic (I didn't check all of them), so I buy the two hits.